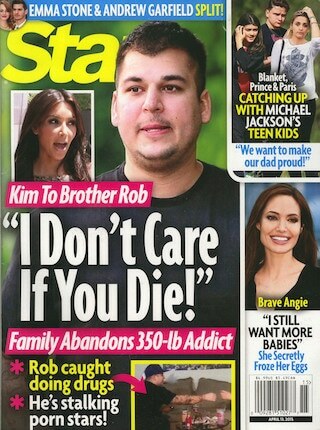 Why Kim wants to get rid of Rob. It seems Rob Kardashian’s woes have gone from bad to worse as the reality star has now fled and holed up in a hotel purportedly after wishing to estrange himself from his piranha family, including Kim Kardashian who has had all she can take from her ‘dead beat’ brother. Khloe Kardashian: I am planning on getting Rob Kardashian evicted. The same source tells Rob is staying at a hotel named Stay, which couldn’t be a better fitting name for a hotel and Rob’s predicament if the universe compelled one. An upcoming show sees our collective media whore Kim telling she has had enough of her brother Rob’s issues (the kettle calling the caboose very black?) and that she thinks it’s time for the family to stop placating to him. Slight pause. Repeat the above words- ‘give it up.‘ Continuing…. Current embargoes include no more money for Rob and the threat of cutting him all together out of the family free for all franchise if he doesn’t pull his socks up. Oh no Rob! What are you going to do? Reports hollywoodlife: It seems that the family is embarrassed by Rob and afraid of how he may affect their image. Please Rob go to the gym or at least eat one less Oreo cookie for dinner tonight. What do you think kids, is there a chance for Rob? Or is this just a mirror reflection of what’s currently going on in your lives minus the hundreds of millions that will soon see you living in a card box on a desolate street corner called ‘Don’t Stay’?